That was before the herdsmen had kid­napped and murdered the traditional rul­er of Ubulu-Ukwu in Delta State. That was before the herdsmen conducted their full-scale terrorist invasion of Agatu land in Benue State practically paralyzing and occupying eight local governments in the state and killing at least 500 per­sons and burning scores of towns and villages. That was before the Ugwuneshi incident in Enugu State where a dis­tressed community being harassed by the herdsmen was gathering to discuss its predicament. Suddenly Nigerian Army trucks arrived and, as the herdsmen cheered, the army bun­dled 76 men into their trucks and on to the Umuahia Prison. Enugu State Governor Ifeanyi Ugwuanyi then went to Umuahia, trying to secure the freedom of the humiliated men, and dropped a tear or two. But that was just the beginning of his anguish. In Ugwuneshi he was dealing with 76 men unjustly imprisoned. He broke down last week when he had to see recovered dead bodies of men slaugh­tered by the same Fulani herdsmen at Ukpabi Nimbo, Uzo-Uwani. The rampaging herdsmen had at­tacked and burned seven villages – Nimbo Ngwoko, Ugwuijoro, Ekwuru, Ebor, Enugu Nimbo, Umuome, and Ugwuachara. The most frightening part of the attack on Nimbo was the high level discipline and military precision of its execution. The Enugu State Govern­ment had been informed of the im­pending attack and the governor had promptly convened the state’s secu­rity council meeting which included every arm of the security agencies – the Enugu Garrison Command 82nd Division of the Nigerian Army, the Commissioner of Police, the Depart­ment of |State Security, and Prison officials. Each arm assured the gov­ernor that it would do everything to pre-empt the attack. The herdsmen apparently operate at a much higher level and, so, the best laid plans of the governor and the state’s security agencies were thwarted by Fulani herdsmen. That sense of impotence and helplessness necessitated the gover­nor’s recourse to and the re-mobilization of the state’s indigenous neighborhood watch. With the unanimous approval of the traditional rulers and the association of town unions, Governor Ugwuanyi had to cough out N100 million to begin the process of activating the vigilante net­work. The scariest part of the Nimbo disaster was the reaction of the 19 governors of Northern Nigeria who flat out denied the fact known to all that Fulani herdsmen had conducted the massacre. Indeed, in a show of righteous indignation, they warned Nigerians to stop ‘insulting’ Fu­lani herdsmen. 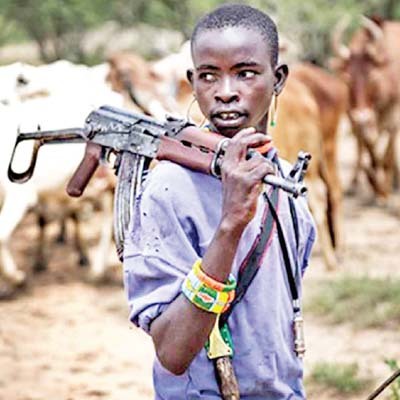 The Nimbo attack confirmed the un­spoken fears of many Nigerians of the existence of a well-armed, well-trained, army-supported, militia sponsored by the cattle breeders. It went a long way to explain the brazen impunity, the fact that having killed hundreds of innocent de­fenseless farmers, not a single herdsman has been arrested, much less prosecuted to say nothing of being punished. Since 7th March 2010 when it was first reported that Fulani herdsmen killed over 500 people in Jos, Plateau State, to 14th May 2013 when the BBC reported that the herdsmen killed 53 in North Central Nigeria, verifiable records were kept, and Fulani herdsmen, sponsored by the cattle breeders, have committed enough heinous crimes to deserve a court date at the International Criminal Court. On 8th July2013, the Fulani herdsmen killed 34 people in Benue State. On 26th No­vember 2013 Jihadwatch reported that “Islamic Extremists killed at least 71 Christians in Nigeria…assailants were believed to be Muslim Fulani herdsmen.” On 24th March 2014 Fulani herdsmen killed 36 people in Agatu area, Benue State. A week later the herdsmen sacked and burned 33 villages, killing at least 19 people in the area.